Bekah at her first NICU reunion, held by dad Chris with NICU staff and hospital photographer. I remember the excitement of my high school and college graduations. I was also excited (and a little sad) to watch Bekah this past spring as she graduated from preschool. So far, though, no graduation has surpassed the amazing (and a little scary) feeling of the day we brought home our NICU graduate. Looking back now, our 70-day NICU stay was one where we met some of the most amazing and beautiful people of our lives. From babies to nurses to doctors and everyone in between, we felt surrounded by love on a daily basis, which is why we are always so thrilled each time there is a NICU Reunion. 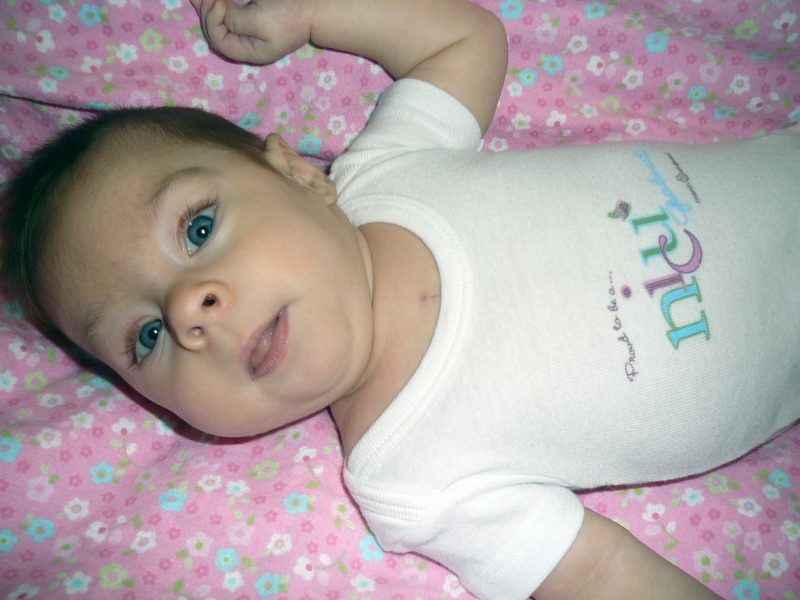 Bekah sports her NICU graduate themed onesie soon after open heart surgery. Each NICU Reunion is a chance to catch up with some of our favorite nurses and others along with the chance to make some new friends. The NICU Reunion in the Mahoning Valley is on Sept. 9 this year. There will be games, prizes, snacks, a photo stand and more. Most importantly, though, it’s a chance to celebrate the amazing NICU graduate in your life, no matter how big or small! Join us for the fun on Saturday, September 9, 2017, 10 a.m.-1 p.m. Akron Children’s Hospital Mahoning Valley, Beeghly Campus, 6505 Market Street, Boardman, OH 44512. Registration is required by emailing krobertson@chmca.org or visiting akronchildrens.org/nicureunion.